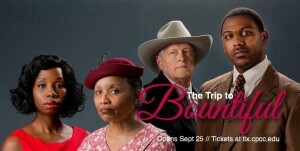 The Trip to Bountiful is the poignant story of Mrs. Watts, an aging widow living with her son and daughter-in-law in a three-room flat in Houston, Texas in 1953. Fearing that her presence may be an imposition on others, and chafing under the watchful eye of her daughter-in-law, Mrs. Watts imagines that if she can get away and return to her old home in the town of Bountiful, she is sure to regain her strength, dignity and peace of mind. First presented on television and then produced on Broadway, this award winning play is “…the rarest of theater experiences, an evening which will prove an indelible memory… “—NY World-TelegramThe cast includes CPCC Communication faculty member Corlis Hayes in the role of Mrs. Watts. You will remember Ms. Hayes for her direction of Joe Turner, Fences and The Piano Lesson. Other CPCC Theatre favorites in the cast include Jonavan Adams as Ludie Watts, Tracie Franks as Jessie Mae and Tom Scott as the Sheriff. Charles LaBorde directs. 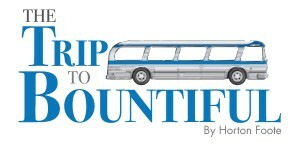 The Trip to Bountiful runs September 25 to October 4 in Pease Auditorium. Contact the SunTrust Box Office at 704-330-6534 or go online to tix.cpcc.edu for tickets. Lots of news today from our CPCC Drama alumni family. Beth Anderson, Summer Theatre alum, has been cast in the national tour of Joseph and the Amazing Technicolor Dreamcoat. Ashtyn Hutchings will play Elle Woods in Legally Blonde during her senior year at FSU. Daniel Watts opened tonight in NYC in the new drama Whorl Inside a Loop at Second City Stage. Caroline Kasey has been cast in Into the Heights at Baldwin Wallace. Matthew Schulman was cast in Godspell at Catawba College.Grace Kidd opened tonight in Throughly Modern Millie at Machayden Theatre. We are so proud of our alumni performing across Charlotte, the region, the country and the world. Get your tickets to our first two shows of the 2015-16 season – The Trip to Bountiful and Phantom of the Opera at the SunTrust Box office 704-330-6534 or online at tix.cpcc.edu.